MamaBreak: NuNAAT Chocolate . . . Prepare to Fall in Love! NuNAAT is Mama Jo's new favorite shampoo! What you should know is I am pretty particular about my hair products. I have fine, straight hair that I wash almost daily. I know all of the hair stylists are cringing, but if I do not wash it daily it is UGLY! It becomes oily very fast, and is about as flat as can be. I am always on the look out for new hair products, but am always hesitant as well. I need products that will not make my hair flatter and duller, and that will give me body and shine, without making it overly oily. NuNAAT's Choclat line is PERFECT. First, it SMELLS like chocolate. I mean, it REALLY smells like chocolate. This is not a shampoo that smells like shampoo trying to smell like chocolate, this one is DELICIOUS! Next, it makes my hair FEEL and look amazing! My hair looks healthy, shiny, and has body . . . and did I mention it smells like chocolate? Finally, I love that it has a nice consistency when you are putting it in your hair! If you did not win our giveaway, they are doing giveaways often on their facebook page! 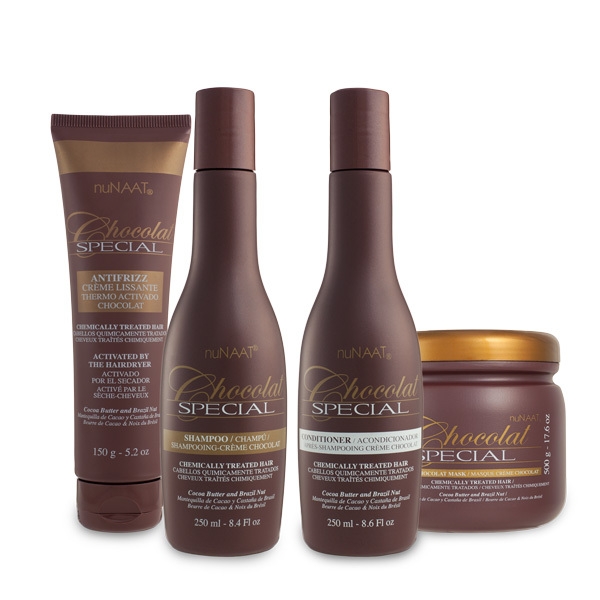 I'm also not a huge chocolate fan HOWEVER I have heard the the Nunaat Chocolate line is awesome for your hair! LOL unsure about the scent but the product sounds great!! I could use shiny and healthy looking!! I am hearing great things about Nunaat! I would try it! My hair is all kinds of crazy! It sounds so yummy! I love chocolate and chocolate shampoo is right up my ally.